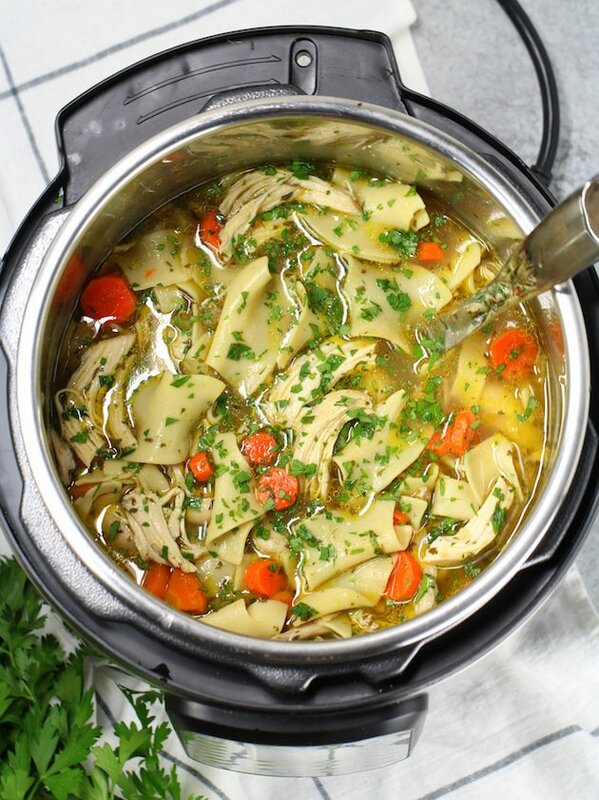 Instant Pot Chicken Noodle Soup – the most luscious and satisfying chicken soup ever! With bold chicken stock, chicken breast and chicken thighs, carrots, onions, garlic and celery, fresh herbs and spices, and so much love! It’s so scrumptious and slurpilicious you won’t be able to stop with just one bowl! 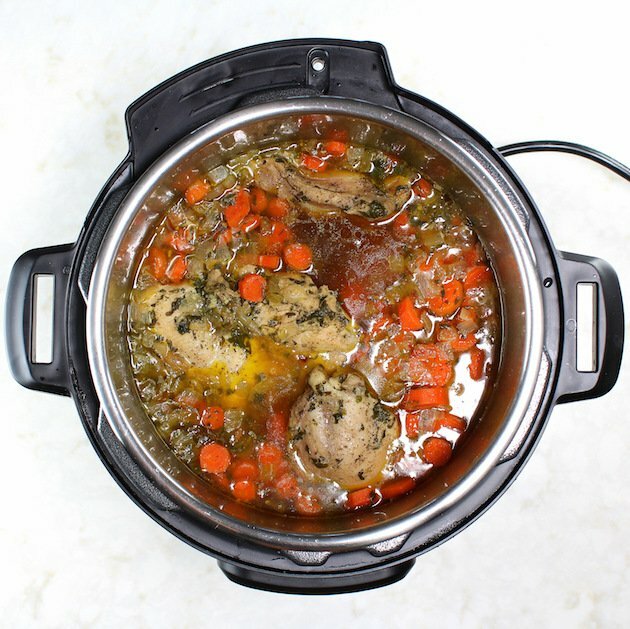 Why I Love Instant Pot Chicken Recipes! 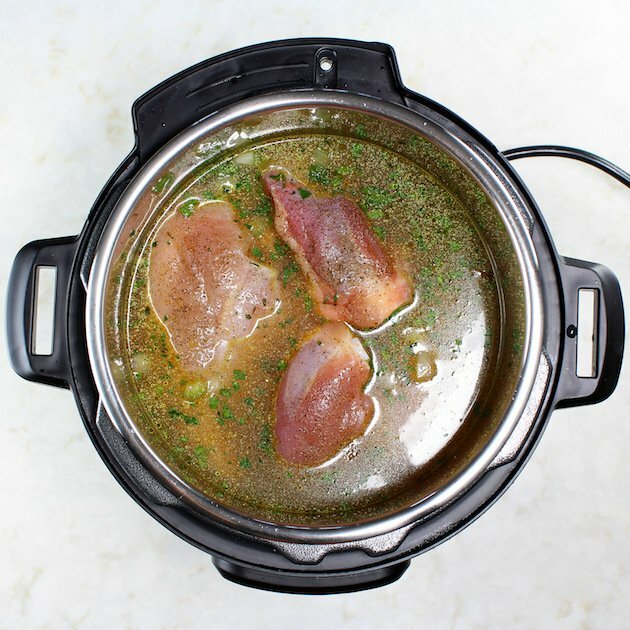 Have you taken the plunge and purchased an Instant Pot yet? I was on the fence about them last year but I made the “nice list” and Santa came through for me. I became the happy owner of the DUO Plus 6Qt 9-in-1 Instant Pot (<-affiliate link). Isn’t she pretty? My favorite thing to cook in this ole’ girl has been chicken. An Instant pot chicken recipe is the bomb dot com! Not just plain instant pot shredded chicken but yummy, flavor infused chicken recipes. You probably know this already, but I don’t do plain very well. It’s flavor or bust for me people! 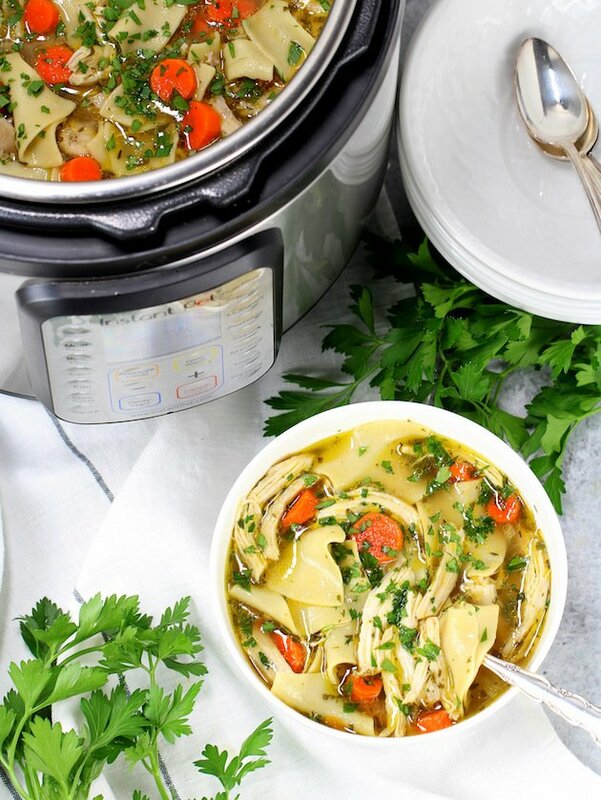 Let’s review my instant pot chicken recipe timeline… First, there was the Shredded Mexican Chicken (AMAZING) then came the Buffalo Chicken and Spaghetti Squash (ridiculously delicious)… then this Instant Pot Chicken Noodle Soup (chicken noodle soup perfection). Most recently I’ve added my Instant Pot Chicken Thighs With Risotto,and these amazing Instant Pot Garlic Parmesan Chicken Wings! I’m just over here trying to guess what you might want to eat next. So please feel free to shoot me an email or comment below and tell me what you want. I love a good challenge – or just some direction – and you should know by now I’m so your girl!!! 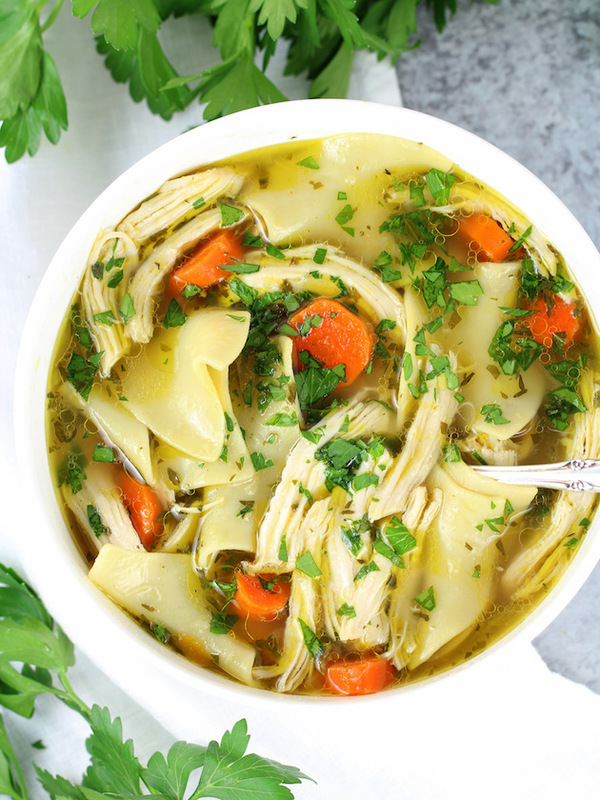 This instant pot chicken soup is so delectable! It tastes like the broth has been simmered for hours and hours in grandma’s kitchen. It’s so rich and flavorful – I can honestly say I like it better than my regular stovetop recipe – may she rest in peace. I must admit luscious chicken broth is the heartbeat of this recipe. I should mention I especially like College Inn’s Bold Chicken Stock. It’s brimming with so much chicken flavor – what can I say? I’m all about as much rich deep flavor that I can get. First things first… turn your Instant Pot on to the sauté (high) mode and let it heat up, add your olive oil, onions and garlic, and sauté 3 minutes. Then stir in your carrots, celery, herbs and spices. Next, add your chicken stock, the chicken breast and chicken thighs, cover and seal the lid and pressure cook for 15 minutes. When the time is up, cover the pressure nozzle with a kitchen towel and release the pressure manually. Meanwhile, shred your chicken and discard the bones. Mix the chicken back into the soup, add some more fresh parsley and it’s ready to serve! 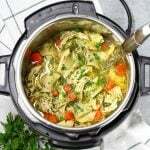 Instant Pot Chicken Noodle Soup – the most delicious flavorsome and satisfying chicken noodle soup evahh! This recipe is sure to be your go-to soup season favorite! Enjoy my friend! If you’re still on the fence about the Instant Pot… read my latest Instant Pot Review here. Instant Pot Chicken Soup... the most luscious and satisfying chicken soup ever! Set Instant Pot to the saute setting – high. Add olive oil, onions, and garlic. Stir and cook for 3 minutes. Stir in the carrots, celery, parsley, thyme, bay leaf, salt and pepper. Then pour in the chicken stock and add the chicken. Lock the Instant Pot lid into place and set the soup/broth pressure setting for 15 minutes. The IP will take 20-23 minutes to pressurize and then it will start counting down the cook time. Once the Instant Pot cycle is complete, manually release pressure by rotating the valve to the “Venting” position. Although it's not "officially" recommended, many people choose to cover the nozzle loosely with a kitchen towel before releasing pressure. Venting should take about 5 minutes. Once complete, carefully unlock and remove the lid. Remove the chicken from the soup. Turn the Instant Pot to sauté mode. When the broth comes to a boil, add noodles, cook for about 5-6 minutes, then turn off (the package says to cook them longer but the noodles will continue to cook while in the pot). Shred with two forks, and discard the bones. Return the chicken to the pot. Taste and season with more salt and pepper as desired, and garnish with additional parsley. Serve with Parmesan cheese and lemon wedges if desired. *If you like more liquid in your soup, use less chicken (11/2 lbs) for this recipe. *If desired, add a little more stock at the end to thin out the soup. *There are different sizes of egg noddles. Mine were quite large. Whatever egg noodle you choose, a good rule of thumb is to cook them half the time the package suggests for this recipe. 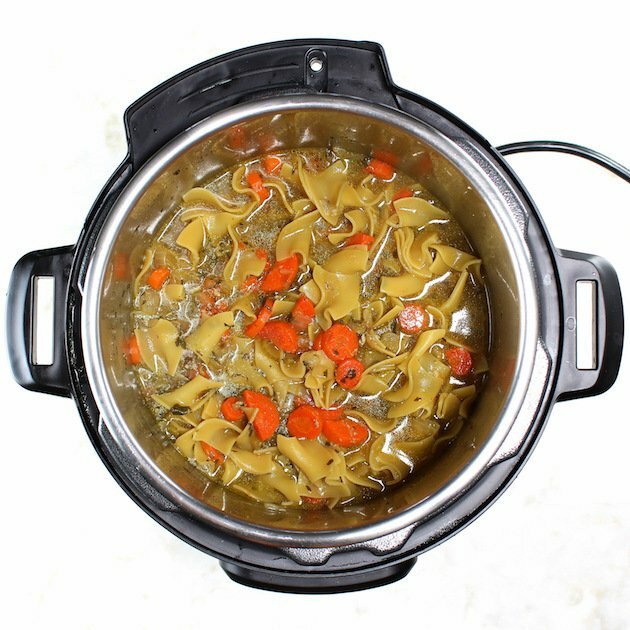 * For this recipe I used the Duo Plus 6QT 9-in-1 Instant Pot! 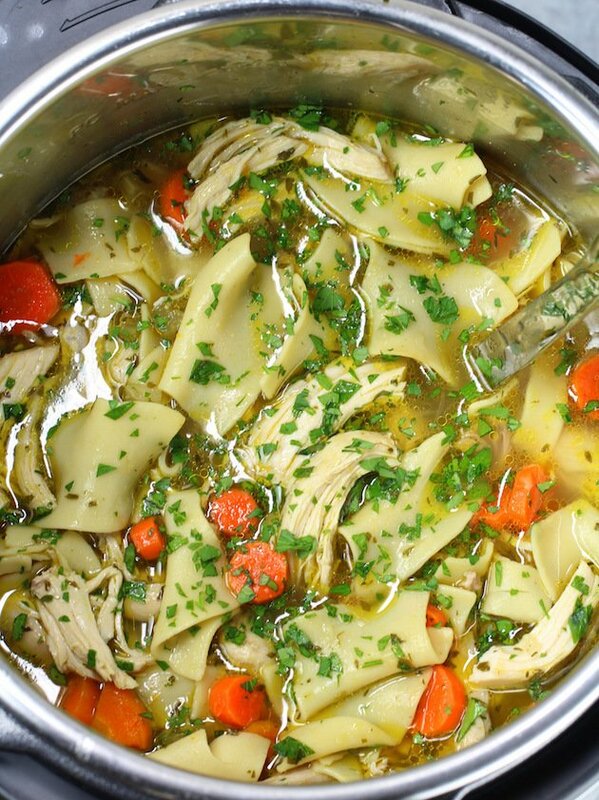 Looking for more amazing Chicken Soup Recipes? Can I use a whole pre-roasted chicken, shredded, for this recipe? This is an amazing recipe! My kids loved it, even the 2 who “hate” soup! I will be coming back to this often. That is fantastic to hear, Jen! If the kiddos “love” it you know it’s a winner! Thanks so much! If I use boneless chicken breasts can you tell me the pressure time? Hi, Kiera, As long as the breasts aren’t too large the cook time should be fine to keep it the same. I recommend using a meat thermometer to make sure the chicken is cooked to 165 degrees. Enjoy! how should i adjust this for frozen chicken? or should i at all? Hi Joanne! The IP will naturally take longer to come to pressure because the chicken temp is so cold. So I would be concerned about the veggies getting too mushy if the cook time was extended anymore. I think the 15 minute pressure cook time should be fine for this recipe with frozen chicken breasts. Be sure to check the meats doneness with a meat thermometer after cooked – it should read 165 degrees. Good luck! I love hearing that, Eleanor! Thank you so much!! Do the veggies get very mushy with so much time under pressure? Hey Judy, I think we messaged on Facebook about this… I cut the carrots on the thicker side for this recipe. I would say the veggies are the same texture that we are accustomed to in most soups. Hope that helps! I made this two nights ago and all I have to say is “Wow!” It was super easy to make, tasted amazing the first day, but the second day, AWESOME! Followed the recipe to the letter! I have an Instant Pot DUO 6 quart, bought it back in January 2016, just started using it in the last month or so and my mind is saying, “What took you so long, Mike?? ?” This device is incredible! I also made baked beans and bacon recipe last week, good God, EVERYBODY raved over it! This little pot takes regular meals and SKYROCKETS the taste miles in the air! It’s not difficult (you have to play with it some, get to know it, don’t be afraid!) and it will make your dishes look and taste like you really know your stuff in the kitchen! Thank you Holly for this amazing recipe! Yum, this soup looks soo good and comforting, it’s the perfect fall soup. I need to get my hands on an instant pot asap! Thanks so much, Sam! Good news – we’re giving away an Instant Pot next week. Check out my Instagram account on Monday to enter! I love a classic like this. This is definitely love in a pot and I love it when it’s cold out or I’m sick because it always makes me feel better! Great recipe! I’m the same way, Jenni! There’s something about CHS that has healing powers. I love that this version is ready so quick when you need it! Aww I love that, Heather! Thank you! I love how rich and deep the flavors develop even though it cooks in a fraction of the time as the stovetop version. This looks really delicious. Perfect balance of chicken and noodles. Wonderful. Thanks so much, Emily! I’m big on balancing my carbs and protein. You gotta have the right mix of both! This looks lovely. Such an easy and simple recipe to put together. Cooking in the pressure cooker anyways keeps hands free and the result is absolutely scrumptious. Cant wait to try this one soon. Thanks so much, Aditi! I agree – the pressure cooker is just so handy with how it does the work for us. I hope you enjoy it as much as we do! How good is the instant pot!!! Chicken noodle soup is my absolute favorite when the weather cools, and I love how quick and easy the instant pot makes the whole process. Yess – I’m so the same, Donna! Thank you! The broth taste like it’s been simmering for hours! This soup is perfect for cold weather here. Thank you so much for sharing. Can’t wait to try this out. That looks so easy and good! 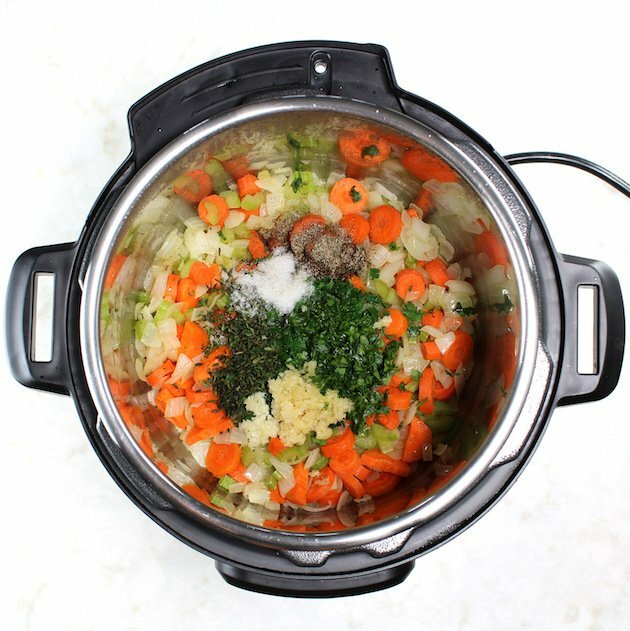 Now that we’re finally coming into soup season, I plan to start making soup for lunch most days – and now that we’re living with his parents I’ve found my pressure cooker is often the easiest way to do that. I”m looking for more recipes! Thanks Anne! You’re going to love it… let me know how it turns out!! This is just my kind of hearty comfort food, I could it eat chicken +noodle soup all winter long! Thanks Andrea – it’s quickly become a household favorite… and I love how fast the IP makes it! Wow. This soup looks so thick and delicious! And I love that you used chicken thighs in it. They just add so much richness and flavor. Great recipe! Thanks Daniela! Using thighs was definitely a good call… let me know how it turns out for you! 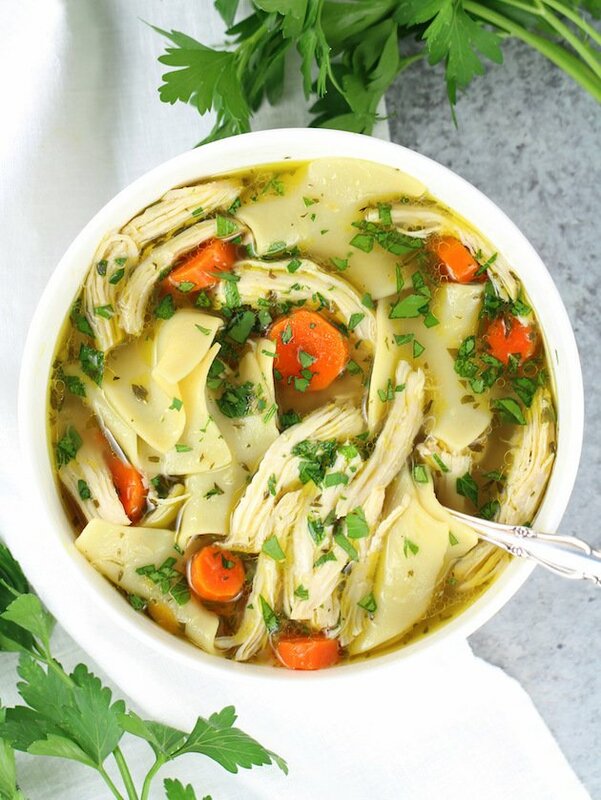 I just made this soup and my husband said I need to keep this recipe because it is the best chicken soup he has ever had…. That says it all! Thanks Cheri! I love hearing that! I so glad you both liked it! This recipe is a reminder that I need to use my Instant Pot more often. I love how easy this is . The perfect meal for fall and winter. Yes!! That instant pot is so versatile!! It still amazes me how quick you can cook things in an instant pot. I cant believe I haven’t made chicken noodle soup… going to remedy that after reading how easy it is with your easy instructions! Thanks! Thanks Michele, you are going to love it!! Yummy! Is there anything better than chicken noodle soup when you aren’t feeling well? This recipe will definitely help for the cold I have right now, thanks for sharing! Thanks Aleta – hope it helps you feel better quickly! !